By volunteering with Town of Gawler you will be given the opportunity to share your passions, abilities and skills in meaningful ways that strengthen community capacity. Our volunteer programs create a sense of belonging, promote social inclusion, challenge inequity, encourage sustainable practices, and promote community wellbeing. Volunteers make valuable contributions to community services, improve the quality of life for those in need and strengthen community links as well as contributing significantly to the positive experiences of residents, businesses, visitors and students. Town of Gawler recognizes and greatly appreciates the time and service given by our volunteers. In fact, many of Council's community programs are highly dependent upon the participation of caring and committed volunteers. Volunteering can be fun - meeting new people, helping others, learning and developing new skills. If you would like to become a volunteer – we’d like to hear from you. The Gawler Visitor Information Centre is looking for enthusiastic volunteers to join our vibrant team. The Gawler VIC provides a 7 day a week service that assists visitors and informs people about Gawler and the surrounding region. Volunteering with the VIC is a great way to meet people, expand your knowledge of the Town and surrounding areas, assist visitors and contribute to the community. You need a bright, cheerful and outgoing personality, be someone who enjoys meeting and helping others and who loves Gawler as much as we do! Good knowledge of Gawler and the Barossa area is essential. High level of communication and customer service skills. Money handling experience is required. Initial training is provided and opportunities for further training are offered. Some weekend rostering is required. Do you enjoy working outdoors? Would you like to be part of a friendly team dedicated to keeping the Town of Gawler graffiti free? The Gawler Graffiti Removal Program is now looking for new, enthusiastic volunteers to join it's team. All training is provided. For further information about volunteering with the Town of Gawler, email volunteering@gawler.sa.gov.au or call 8522 9225. The Civic Centre provides some new and exciting volunteer opportunities. This includes Tour Guides and Greeters, as well Youth Program Support and Heritage Collection Volunteers. A small team of volunteers who remain committed to helping to maintain, restore and wind the clock on a weekly basis. 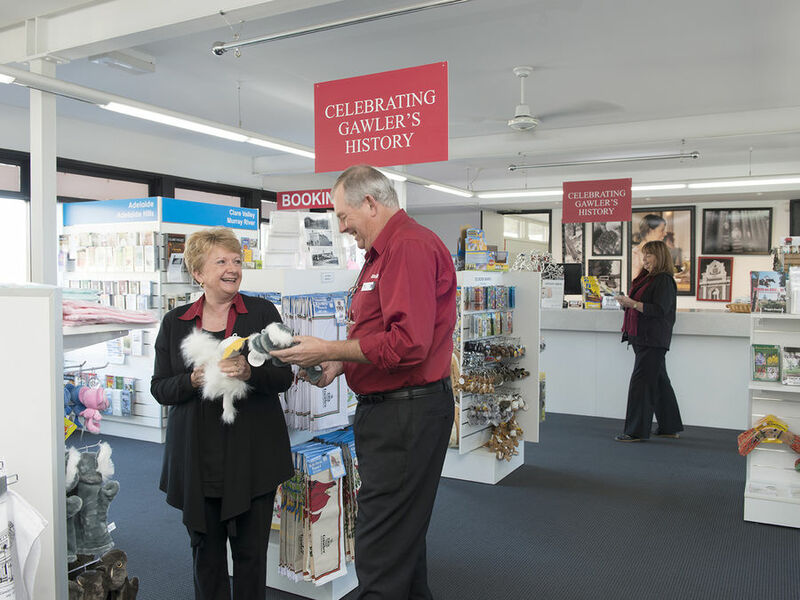 The Gawler Visitor information Centre is open 7 days a week and is staffed by a dedicated and enthusiastic team of volunteers, who play a vital role in helping others to discover all there is to see and do, in and around Gawler. In addition, they also help locals and visitors with the bookings of accommodations, sites and travels. Operating on Tuesday, Wednesday and Thursday of each week, the Graffiti Removal Program provides a rapid response to help eradicate and deter graffiti from occurring within the community. Volunteers help support the functions of the Home Assist Program by producing the Connecting Consumers newsletters, providing a voice and say about how the Program functions through the monthly Consumer Reference Group meetings and assisting at Special Events and Functions. The Gawler Public Library Service is supported by a team of volunteers, both directly and through the Friends of the Library team. Included in these programs are services such as Library home visits which offers a monthly delivery service for people living in the Council area who are unable to leave their home & have nobody that can visit the library for them. Provides assistance with the regular Roller Skating sessions that are held at the Gawler Sport and Community Centre, helping to provide a safe and enjoyable experience for those attending. Providing support and assistance in the preparation of and delivery of Council events and programs. Helping to develop and deliver a range of Council programs and events, designed especially for children and young people living in and around Gawler.